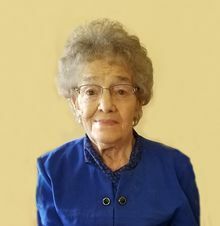 Evelyn L. Goerdt, age 84, of Sauk Centre, Minnesota, died Friday, November 2, 2018 at Galeon Community Memorial Home in Osakis, Minnesota. A Mass of Christian Burial will be held at 11 a.m. Wednesday, November 7 at Our Lady of the Angels Catholic Church in Sauk Centre with Rev. Greg Paffel officiating. Interment will be at Calvary Cemetery in Sauk Centre. Visitation will be from 4 to 8 p.m. Tuesday and from 9 to 10 a.m. Wednesday at the Patton-Schad Funeral Home in Sauk Centre. Parish Prayers will be at 5 p.m. Tuesday evening at the funeral home. Evelyn Louise Kaas was born December 9, 1933 in Melrose, Minnesota to Louis and Ann (Hoffman) Kaas. On October 6, 1954 she was united in marriage to Anthony Goerdt, Jr., at Our Lady of the Angels Church in Sauk Centre. Evelyn and Tony raised their family of eight children on the farm and for many years, her primary farm task was milking the cows. When they were able, they enjoyed traveling together. Over the years, Evelyn crocheted dozens of beautiful afghans for her children and grandchildren. She enjoyed playing the organ as well as games like Quiddler, Scrabble, Boggle and cards. She especially enjoyed spending time with family and daily morning coffee with whomever could make it each day. Evelyn was a member of Our Lady of the Angels Catholic Church and the Christian Mothers. Survivors include her eight children, Mary (Alcuin) Kampsen, and Michael (Mary) Goerdt, all of Sauk Centre, Carol (James) Korte of St. Cloud, Minnesota, Diane (Don) Leukam, David (Sonja) Goerdt, Lois (Dean) Warnert, Joyce (Joseph) Frericks and Janet (Thomas) Schulte, all of Sauk Centre; 26 grandchildren; 44 great-grandchildren; 4 step grandchildren and 2 step great-grandchildren; sisters, Sally Ley and Virginia (Donald) Toenies; sisters- and brothers-in-law, Edwina Dehler, Anita Eskelund, Marilyn (Fritz) Uphus, Rose Uphus, Julian (Audrie) Goerdt, Marian Gieske, and Louise Echola. Evelyn was preceded in death by her husband, Anthony "Tony" Goerdt, Jr. on Oct. 2, 2009; son, Joseph on July 17, 1958; grandsons, Curt and Carl Schulte; son-in-law, Mark Meyer; parents; twin brother, Lawrence Kaas on Sept. 14, 2018; sisters- and brothers-in-law, Agnes Kaas, Donald Ley, Herbert Dehler, Evelyn and Ferdie Stepan, Ione and Robert Kukla, Roger Goerdt, Lloyd Eskelund, Sylvester Uphus, Joe Goerdt, RuthAnn Gieske, Barbie and Bill Spellerberg, and Rick Echola. Serving as casket bearers will be Dave Kampsen, John and Ted Goerdt, Ben Frericks, and Justin and Ryan Schulte. Cross bearer will be Rachel Frericks and scripture bearer will be Kristina Gerhardt. Readers will be Diane Leukam and Mary Goerdt. Petitions will be read by Debbie Wellman. Gift bearers will be Melanie Borgerding and Janelle Meyer. Mass servers will be Emma and Sara Kittelson. Eucharistic Ministers will be Donald Toenies and Annette Kittelson. Organist will be Sharon Smode.